The 23-time grand slam singles champion will remain in Paris to undergo further treatment. 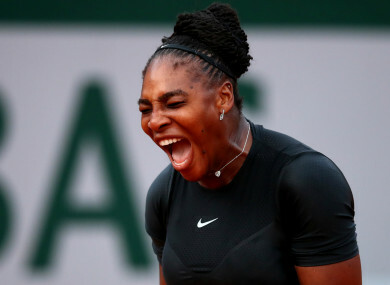 SERENA WILLIAMS HAS withdrawn from the French Open due to a pectoral injury ahead of her eagerly-awaited fourth-round showdown with Maria Sharapova. Williams revealed how she started to feel the problem during her 6-3 6-4 victory over Julia Goerges on Saturday, though she did play doubles alongside sister Venus on Sunday at Roland Garros. The 23-time grand slam singles champion will remain in Paris to undergo further treatment and is unsure when she will be ready to make a return to action. “I’m beyond disappointed. I gave up so much and gave everything on the court, all for this moment,” Williams told a hastily-arranged news conference. Williams was playing in her first grand slam since giving birth to her first child last September, dropping just one set on her way to reaching the last 16 in the French capital. Sharapova – who had lost her last 18 meetings with her long-time rival – will now face Garbine Muguruza or Lesia Tsurenko in the quarter-finals. Williams revealed she decided to play in the doubles to test her fitness but now faces a race against time to be fit for Wimbledon. “I tried a lot of different tapings and support and it didn’t really get a lot better,” the American added. “I’ve never had this before. I’ve never felt this in my life – it’s so painful. Email “Serena Williams withdraws from French Open ahead of Sharapova showdown”. Feedback on “Serena Williams withdraws from French Open ahead of Sharapova showdown”.